Menifee Valley lies 80 miles east of Los Angeles in Riverside County, halfway between the cities of Perris and Temecula. Settlers originally ventured into this isolated wilderness of sagebrush and live oaks to stake out mining claims, dig for gold, and plant wheat. Others came for the healthy climate. Homes were built miles apart, and newly constructed schools became community focal points and information centers. Menifee Wilson, a native of Tennessee, staked several claims across this serene valley, and his name just never went away. Settlers bred horses, planted orchards, drilled wells, and served as trustees on school boards. Hunting rabbits, quail, and doves were popular, and picnics and fishing in ponds and seasonal streams became family affairs. 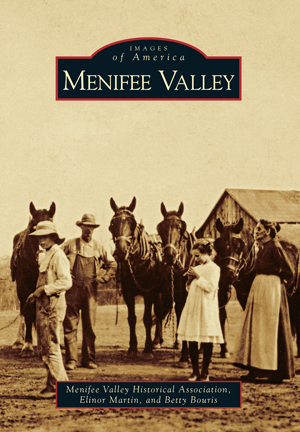 In 1950, perhaps 100 families lived in the 50 square miles of Menifee Valley. Today this panorama of pastoral landscapes is home to 65,000 people. Coauthors Elinor Martin and Betty Bouris assembled these early photographs, dating from 1880 to 1960, for the Menifee Valley Historical Association, many loaned by descendents of pioneer residents, who still call Menifee Valley their home. Research included the use of family oral histories.